Why Are We Talking About This Contract? 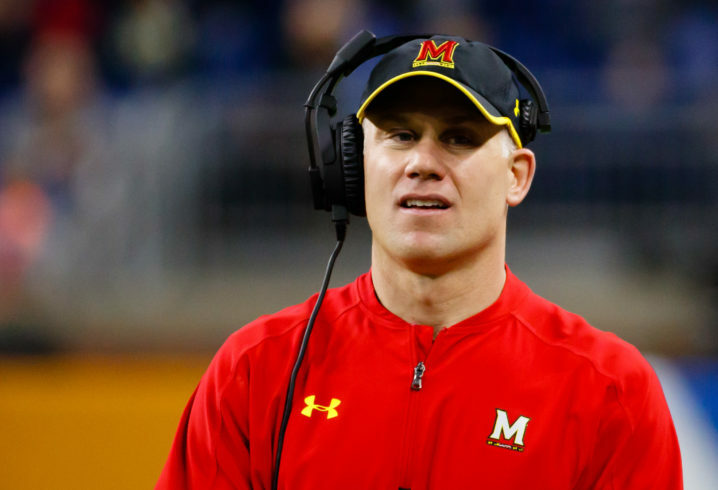 The Employment Contract between Maryland and DJ Durkin expresses the duties & expectations each party agreed to take on in the employer-employee relationship. If either party fails to perform even one of their many duties contained in this Contract, that party has broken a promise. In the legal world, we call this a "breach of contract". A breach of contract is not an "illegal" action because there is no law on any level that says, "You shall not break contracts." Rather, it is simply breaking a private promise. When a breach of contract occurs, the non-breaching party has the right to pursue damages in a civil court or take action, but it does not have to do so. Let me repeat that: The non-breaching party has the right to act when the other party breaches, but it can choose not to act on that right. What does that mean? Schools in sticky situations like Maryland and Ohio State University may have grounds to fire a coach when the facts show that the coach failed to perform a duty in their employment contract, but the school can just as much choose to keep them employed in their current positions, and that is well within their rights. What Does DJ Durkin's Employment Contract Say? The last portion of Section 1 is a nice umbrella statement that says, generally, what Maryland expects of Durkin in performing his duties - "The Coach shall devote his best efforts full time to the performance of his duties reasonably assigned ... with the desired goal of maintaining the high moral and ethical standards commonly expected of the Coach as a leading representative of the Department of Intercollegiate Athletics (Department) at the University." Even as an umbrella statement, though, this section has a power punch. Durkin must give not "good" efforts but his "best" efforts, and he must do so not only most of the time but "full time." Of particular importance in this case, specifically, is "the desired goal of maintaining the high moral and ethical standards commonly expected of the Coach" because society likely expects a Head Football Coach of a D-I program in a Power Five conference to be someone that has his players' health and best interests in mind. The opening of Section 3 and subsections (b) (c), & (d) could be implemented under the alleged circumstances, too, and in an even stronger way, for they express explicit responsibilities Durkin has as the Coach. He is responsible for "oversight and management," generally, which includes but is not limited to "training and coaching ... to compete successfully in the Big Ten and the NCAA," "recruiting, recommending the employment of, supervising, and evaluating the performance of the Team's coaching staff," and making sure that his assistants and football staff comply with Maryland's policies, procedures, and rules and regulations and, moreover, reporting any violations. While this language is pretty standard in a college coach employment contract, it can be tempting to skim over the particular words and phrasing. If we want to get really nit-picky, we could even call upon what is called "statutory interpretation" and "canons of construction" in the legal world. Although this is not a statue or rule, per se, it can help the parties to a legal issue - here, Maryland and Durkin - construct their respective arguments for or against a breach of contract. These canons include using the word's plain meaning in their ordinary sense, avoiding redundancy in parts of the rule, and deferring to the agency's reasonable interpretation of the rule. A. Fire DJ Durkin For "Cause"
Section 12(c) defines the terms on which Durkin can be fired for "cause," and it refers to the duties laid out in Sections 1 and 3 (see above). That reference, here being called "performance standards and performance commitment" is classified as "material misconduct", which is one of the five ways Maryland can part ways with Durkin in the least costly way. Durkin is the person who brought on his staff, including Court, and is supposed to evaluate and supervise Court and the rest of his staff as they perform their own duties. Here, if Durkin was present - or, even more broadly, aware of the workouts and the conditions surrounding the workout - he should have made proper medical care readily available in case it was needed and, where needed, attend to medical needs in a swift manner because he would have been prepared. Heck, even if Durkin was not there or even if there is not a "toxic culture" in the Maryland Football program, one could interpret the Contract to say he violated the terms by recommending and bringing Court onto his staff. At one point or another, whether it be before he came to the program or during his time as a strength and conditioning coach, Durkin had to have seen how Court handled workouts. If Durkin failed to properly evaluate Court's coaching style and methods, including the sort of preparation needed or mannerisms like brushing off signs of imminent necessary medical attention, there is an argument that he violated Section 3(c). The umbrella duty in Section 1 can be solid in evaluating whether Durkin could be fired for any "toxic culture" that may be in the program, since it is reasonable to expect that a Coach of high moral and ethical standards would not allow that to happen. Also, if Durkin truly did not attend to McNair in the way that reports are saying, it is safe to say he did not "substantially fulfill" his duties and obligations created by this Contract, for despite this being an agreement between the university and the Coach, the Coach is supposed to have the kids' best interest and safety in mind as he is fulfilling his duties. There is so much more supporting statements to add to this argument, but I do not want this to be too lengthy. Draw up some more supporting arguments yourselves! On the other hand, Durkin could counter-argue in a meeting with the Athletic Director that in order to compete in the Big Ten and NCAA, training has to be challenging, and the student-athletes are adults who can reasonably be held to recognize when their body is not feeling alright. This argument is certainly weak, though, because his Contract specifically states that he is responsible for the management and oversight of the football program, and Maryland definitely has some procedures and guidelines on how to prevent and, where necessary, handle student-athletes medical attention needs. He could also argue that he was not aware of the tactics and methods Court utilized that some people thought crossed the line or - specifically in this instance - led to a young athlete's death despite reports about what went down while Court was at his previous employer, Mississippi State, but regardless, Durkin recommended the hire. B. Fire DJ Durkin Without "Cause"
Section 12(d) is the "best interests" clause, where Maryland has the right to fire Durkin even where the reason does not fall under the first three subsections of Section 12 when terminating his employment is in the best interests of the university. This firing without "cause" situation, as it was defined earlier in Section 12(c) triggers different rights and entitlements for both parties to the Contract from that point forward, but again, Maryland can choose whether it wants to act on this section in the first place. Durkin would leave with 65% of his aggregate base salary and supplemental income from the Contract's effective date through the end of 2010 in liquid damages if he lost his position under this scenario. As stated earlier, Maryland can 100% choose to keep Durkin as their Head Football Coach. Even if it decides to do so, it still has some additional rights on which it could act that derive from section 13 in the Contract. Maryland could flat out keep him without any further punishment besides administrative leave he is presently serving. On the other hand, Evans could dish Durkin disciplinary terms other than termination like a written reprimand, a suspension with or without pay, loss or forfeiture of different salary elements, and probation where there is "reasonable belief that the Coach engaged in misconduct or failed to perform one or more of his duties." Apart from suspension, if Durkin stays and is disciplined in one or more of those ways, he has the right to have a meeting with Evans, who has the final determination. However, if Durkin is suspended, he can appeal Evans' decision to Loh, who has the final determination in that case. BOTTOM LINE: This is a contract job in an at-will employment relationship. If the investigation contain facts that show Durkin breached the Contract by failing at any one of his contractual duties and responsibilities, Maryland has the right to fire him, but it has every right to keep him as the Head Football Coach as well. If Maryland chooses to fire him, it can try to classify his breach as one falling under the "cause" definition, and if it cannot or if it simply elects not to enter what could be a longer battle against Durkin if his employment is terminated for "cause", Maryland can fire him for any reason that is in the "best interests" of the school. In any event, durkin's reputation is likely tainted professionally as well as personally in the eyes of public opinion.